Banking on our enriched industry experience, we are able to supply Dehydrated Coriander Leaves. Coriander also known as cilantro r Chinese parsley, is an annual herb in the family Apiaceae. All parts of the plant are edible, but the fresh leaves and the dried seeds are the parts most traditionally used in cooking. We are trusted name in offering quality Dehydrated Coriander Leaves, these leaves are highly appreciated by our client. Our experts team duly test these dehydrated coriander leaves on various quality parameter before deliver them to client. - Used in the treatment of skin inflammation , high cholesterol levels, diarrhea, etc. We are remarkable enterprise, instrument in offering superior quality Coriander Leaf Flakes. Being a client-centric organization, we are engaged in manufacturing and exporting Freeze Dried Coriander. 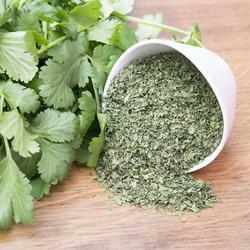 We offer fine quality dried coriander leaves suitable for regular consumption. 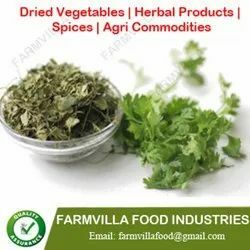 Our firm is well-known and trusted entity in the market by providing a top quality of Dehydrated Coriander Leaves to the admired patrons. From our wide consignment, we are affianced in supplying Dehydrated Coriander Leaves.